The Federal Housing Administration (FHA) has released a mortgage loan limit update. 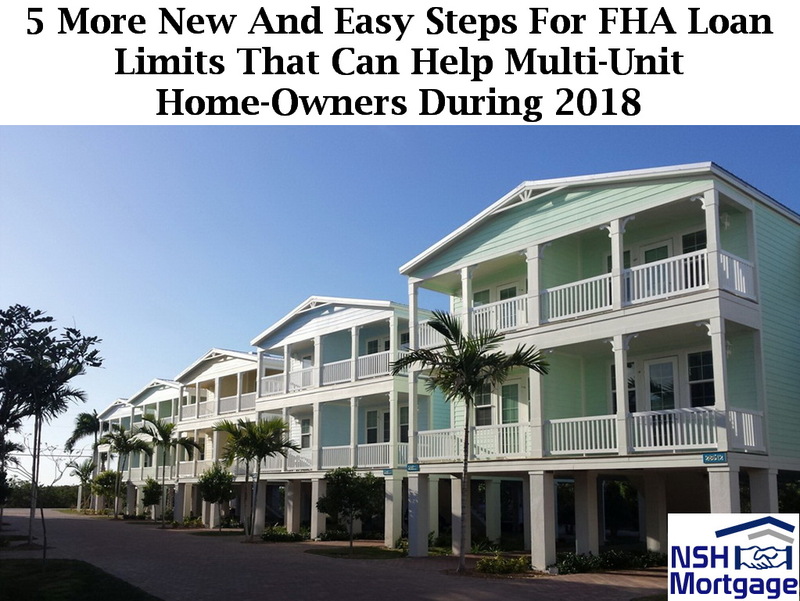 Five more new and easy steps for FHA loan limits that can help multi-unit home-owners during 2018. NSH Mortgage has the knowledge and tools that can help you with discovering how much you can save on your multi-unit home. Effective immediately, FHA insured mortgages are now available for loan sizes up to $679,650 for one-unit homes. FHA loan limits are higher for double unit, triple unit and quadruple unit properties, and for homes in Honolulu, Hawaii and several other Hawaiian cities. During 2018, FHA loan limits may be higher in nearly every county nationwide, with a new floor loan amount of $294,515. It can be confusing, but the FHA is not actually a mortgage lender. Rather, it is a mortgage loan insurer. The FHA provides insurance which protects against loss the banks which make FHA loans. The FHA keeps a book of rules and says, so long as you make loans that follow these requirements, we will insure those loans against loss. FHA backed loans are often easier for which to qualify than their conforming mortgage counterparts, and come with several home buyer friendly characteristics. FHA mortgages require a down payment of just 3.5%. FHA loan down payment monies can be gifted from a family member. The minimum credit score requirement for a FHA loan is 500. There are other FHA loan perks, too. For example, FHA loans are assumable. This means that a future buyer of your home can assume its existing mortgage at whatever the mortgage rate happens to be. If today’s mortgage rates are 4% and rates are 10% when you sell, instead of applying for a new loan, your buyer can assume your existing 4% FHA mortgage rate instead. Another FHA loan perk is that FHA mortgage rates do not change with low credit scores, or property type. FHA mortgage rates are the same, no matter whether your score is a 740 or a 580. For instance, whether you live in a single family home or a quadruple unit. Everyone gets access to the same FHA mortgage rates. In particular, to get approved for a FHA loan, your loan size must be within the maximums of what the FHA will insure. Known as FHA loan limits, these maximums vary by area, based on local median home values, and by property type. FHA loan limits, for example, are lower than FHA loan limits in the Bay Area of California, and in Los Angeles and Orange County. In addition, FHA loan limits on a double unit home is higher than the limits on a condo. There are four tiers of FHA loan limit pricing. There is a standard tier, a mid-range tier, a high cost tier, and a special exception tier. Most of the United States is considered standard tier. For single unit homes properties which include single family detached homes, town-homes, row homes, condominiums, and co-ops FHA loan limits now begin at $294,515. Standard FHA loan limits, like all loan limits, are based on a mathematical formula. The floor, which governs FHA loan limits in more than 80% of U.S. counties, is equal to 65% exactly of the conforming loan limit of $453,100. It is used in cities where you can multiply the median home price by 1.15% and the product is less than $294,515. Mid-range FHA loan limits apply to cities where you can multiply the median home price by 1.15% and get a product greater than $294,515. Whatever that product is, so long as it is less than $679,650, is the local FHA loan limit. Areas in which mid-range FHA loan limits apply include Cincinnati, Ohio, Philadelphia, Pennsylvania, Minneapolis/St Paul, Minnesota, Boston, and Massachusetts. High cost FHA loan limits are the maximum insurable FHA loan size sometimes called the ceiling. High cost areas are areas in which the median home price multiplied by 1.15% is greater than $679,650. There are about 80 of them nationwide. High cost areas include Washington, D.C. suburbs Loudoun County, Virginia; and Bethesda and Potomac, Maryland; as well as San Jose, California, and the entire New York City metro area. The FHA grants special exception loan limits for certain parts of Hawaii, Alaska, Guam, and the U.S. Virgin Islands. The elevated loan limits are designed to offset higher construction costs in these states and territories. Among the biggest benefits of using a FHA backed mortgage is access the agency’s designated home loan refinance program, the FHA Streamline Refinance. The FHA Streamline Refinance is available to homeowners with an existing FHA mortgage only. It gives homeowners the ability to refinance without having to verify income, credit, or employment. The FHA Streamline Refinance has three main qualification standards. First, to get qualified, you have to be making your current mortgage payments on time. The Federal Housing Administration does not extend the FHA Streamline Refinance to homeowners who are behind in their payments, or who have a history of falling behind on the payments. The FHA wants to see that your last three mortgage payments have been paid on time, and that you have been late on payments no more than one time in the last 12 months. Second, your current FHA mortgage must be at least six months old. The FHA will verify that you have made at least six payments on your current mortgage refinance before allowing you to use the FHA Streamline Refinance program. Once you have made six payments, you have cleared this hurdle. Furthermore, thirdly, this agency will verify that there is a benefit to your refinance. Known as the Net Tangible Benefit clause, your mortgage payment must reduce 5% or more to become FHA Streamline Refinance eligible. If you meet these requirements, the standard FHA loan limits will not apply. Homeowners using the FHA Streamline Refinance get access to elevated FHA loan limits if their current FHA loan amount is above 2018 limits. For example, a homeowner purchased a home with a FHA loan in 2013 when the FHA loan ceiling was $729,750. The borrower can get a FHA streamline loan at $700,000 even though current limits stand at $679,650. The FHA Streamline Refinance is among the FHA’s most popular programs. We are committed to helping you find the right mortgage product for your needs. We understand that every borrower is different, and we offer a variety of products to meet your individual requirements. We make the process of securing a mortgage simple and straightforward by offering you the latest in financial tools that enable you to make sound financial choices. Website Design & SEO, by Vis Media Design© 2019 NSH Mortgage®. All Rights Reserved.